FRP Translucent Sheet is a kind of transparent natural lighting product which is successively shaped through mechanization by adopting non-soda fibreglass, reinforced polyester resin, imported high- performance anti- ageing film and additive.Rainbow FRP Sheet is welcomed by consumers. As it has many merits: bright and clean appearance, light weight and high performance, high light transmittance, anti-corrosion, fireproofing, accurate cross- section size, not seeping, random length cutting, easy to install and service life reaching as long as 15-20 years. 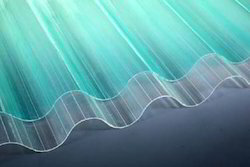 It can be widely applied in natural lighting in animal or plant greenhouse, the roof of industrial workshop and civil construction, wall surface, cover plate and base plate of solar water heater as well as other places which require long-term natural lighting.FRP corrugated sheets that we offer are available in different thickness, size and length. Their rust proof property help in successfully meeting the challenges of any kind of weather. These are U.V. stabilized and therefore resist the harmful effects of the U.V. Rays of sunlight. The Transparent FRP Plastic Sheets allow sunlight to pass through them and thereby provide limited illumination in the shed area, to help save on precious power meat for lighting purpose. Looking for RAINBOW DAY LIGHT SHEETS ?